So I have been challenged this week to find a foreign fad and discuss it by my friend and classmate, Noble. I began searching the Internet to find some fun fads around the world and China has taken the cake for the weirdest new fad. We all know that China does not have the best reputation when it comes to human rights. Well, apparently China has no regard for animal rights as well. 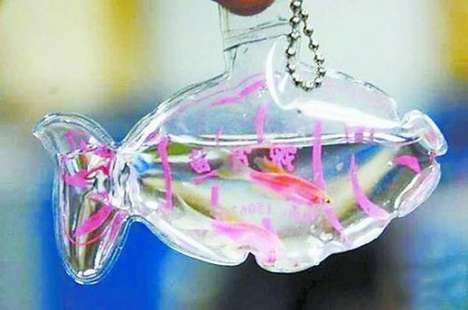 It appears that the latest fad in China is having keychains containing live turtles and fish in them. Weird, right? Well, it's not just weird, it's pretty messed up. I mean, I get that a live fish or a live turtle would make a pretty cool keychain, but at what expense to the poor little creature? There is certainly no way to feed the fish or turtles in the keychain, so what happens? The answer: they die. Apparently, the Chinese vendors claim that the water is nutrient rich, but it is a bunch of nonsense (click here for more details). The turtles or fish meet their demise in a few days, but hey, you sure looked cool with that keychain, right? Wrong. It definitely is NOT cool having a dead fish or a dead turtle hanging in a plastic bag from your keys. It is unfortunate that this is legal in China and it is more unfortunate that people waste their money on such things. Thoughts? I read about this, it's awful! Do they not have any form of animal protection services? It makes me mad to hear stories such as this one. Wow! And to think I wanted to get a fish...guess I can get on and clip it on my keychain! Smdh! it is totally uncool. The fish will die of lack of food and air in a matter of days and don't forget that there is no filtration or sewage system so it will have to live in its own waster in this tiny space! Cruel! !